Two model employees from GM's new line of layoffs. DETROIT—Calling it the automotive company's "toughest and longest-lasting" line of cutbacks to date, General Motors proudly unveiled its new 2008 model layoffs on Monday, bringing months of rumor and speculation to an end. According to industry insiders, the automaker's latest offering of layoffs is by far its largest, with hundreds of unemployed workers expected to hit the streets as early as next week, and thousands more scheduled to come off Michigan assembly lines by the end of spring. "Introducing the all-new, all-American GM layoffs," announced General Motors chairman Rick Wagoner, gesturing toward a lineup of soon-to-be-released factory technicians outside the company's main Detroit plant. "Bigger, bolder, more daring—these 2008 redundancies are sure to create a stir." Urging consumers to forget everything they thought they knew about job security, Wagoner described the cutbacks as "a major breakthrough in downsizing," and claimed GM had set a new benchmark in letting people go. "We've really outdone ourselves this time," Wagoner continued. "Nobody, and I mean nobody, expected General Motors to come out firing the way it has in 2008." While many details have yet to be released, the new layoffs are said to boast a number of exciting features, including automatic suspension of health-care benefits and a no-money-down payment option on all severance and forced-retirement packages. In addition, the 2008 layoffs will come equipped with a three-day notice of termination, rather than the standard two-week notice offered on earlier models. "Our new line of layoffs will forever change the way hardworking men and women get by," General Motors vice chairman Robert A. Lutz said. "No other car company today—be it Toyota, Ford, or even Saturn—can compete with GM when it comes to canning their workforce." More ambitious than last year's line, the new layoffs reportedly underwent a difficult development phase. According to Wagoner, many within the company questioned his vision for the bold cutbacks, calling them unorthodox, impossible, and even reckless. But the General Motors chairman pushed forward, confident that the groundbreaking series of firings could be achieved. 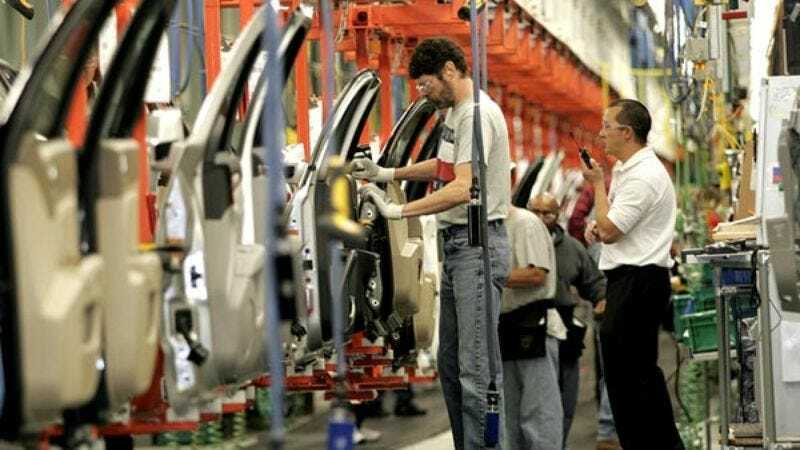 Though the layoffs were his idea, Wagoner said their realization would not have been possible without the help of several thousand dedicated GM employees. "We simply couldn't have done it without everyone's participation," said Wagoner, giving a special thank-you to his former human resources department. "Had our talented pool of engineers, technicians, and skilled laborers not come in day after day, there would have been nobody for us to ask to leave." As excited as General Motors officials are about the layoffs, public reaction has been far less positive. "I'm definitely unimpressed," said Charles Henderson, a Michigan construction worker. "They can dress things up as much as they'd like, but these are just the same old layoffs GM trotted out last year. And come to think of it, the year before that." "I saw some of them parked outside the food bank on Warren Avenue yesterday, and they were pretty sorry looking," Henderson added. "What was GM thinking?" Citing an apparent lack of thought and care behind the layoffs, many have accused the automotive company of only being interested in its bottom line. While General Motors has strongly disputed that claim, the recent firing of its entire public relations department has made it difficult for the automaker to get a positive side of the story out. "I don't know what people were expecting," Wagoner said. "We're General Motors. Firing great people is what we do."